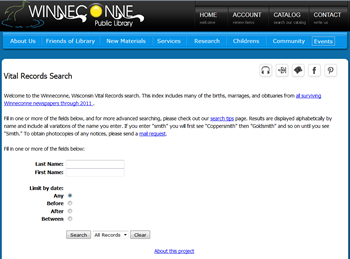 Make your local vital records available for genealogy research through your library's web site! Winnefox can help you move away from trays of index cards and newspaper clipping files -- all you need to do is designate a staff person or volunteer to enter data from your local files, and we'll do the rest! To get started contact Keetra Baker at baker@winnefox.org. 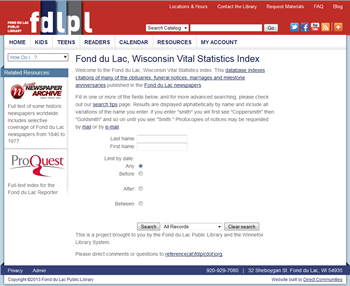 This database indexes citations of many of the obituaries, funeral notices, marriages and milestone anniversaries published in the Fond du Lac newspapers. index to marriage announcements, anniversary notices and obituaries published in local newspapers. Years indexed are 1865 - January 1916, 1977 - June 1980 and 2002-current. 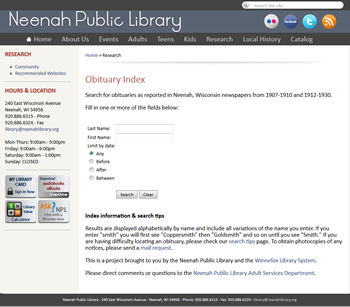 Obituaries as reported in Neenah, Wisconsin newspapers from 1907-1910 and 1912-1930. 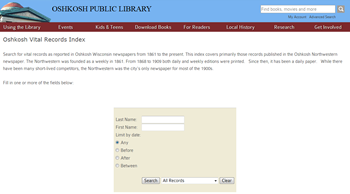 Vital records as reported in Oshkosh Wisconsin newspapers from 1861 to the present. 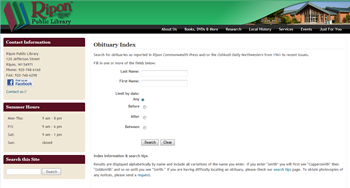 Obituaries as reported in Ripon Commonwealth Press and/or the Oshkosh Daily Northwestern from 1961 to recent issues. 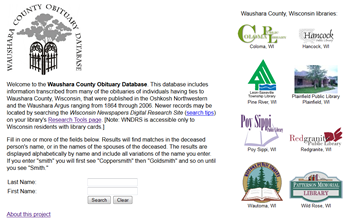 Information transcribed from many of the obituaries of individuals having ties to Waushara County, Wisconsin, that were published in the Oshkosh Northwestern and the Waushara Argus ranging from 1864 through 2006. Births, marriages, and obituaries from all surviving Winneconne newspapers through 2011. Continued data entry for these databases requires a system username and password to log in (to limit data entry to authorized individuals). If you're interested in starting a project and wish to view these data entry screens, or if you are an authorized user of one of these database and have difficulty accessing your database, please contact Keetra Baker at baker@winnefox.org to arrange/fix access.